Regular dental care is an important part of your pet’s wellness program. Tartar buildup on teeth not only causes bad breath, but can affect the ability to play and eat properly. Dental or periodontal (gum) disease can even attack their internal organs including the heart, liver, and kidneys. Dental care should start in puppies and kittens with daily applications of the enzymatic toothpaste. Unfortunately we often don’t see our dog and cat friends until they have reached the stage of gingivitis and periodontal disease and the complaint of “Scout has bad breath and nobody can stand to be around her.” Poor Scout, she does not like the bad breath or the pain that comes with bad teeth either. We are well positioned to help with this. We have an advanced in clinic laboratory to make sure that there are no underlying medical problems that may have led to the poor mouth condition and to make sure we are as safe as can be for anesthesia. 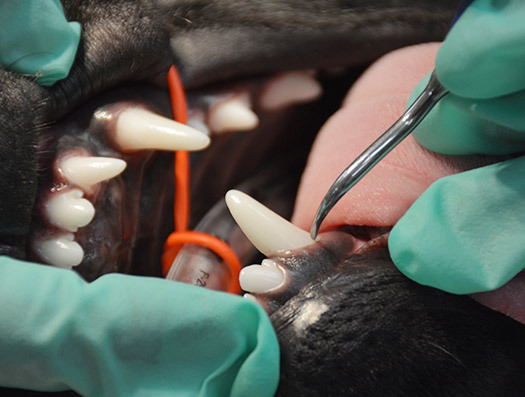 We use advanced anesthetic and monitoring protocols to ensure a safe dental procedure for your pet. We have digital dental x-ray equipment to aid in the diagnosis of periodontal conditions and the most advanced high speed/low speed dental station to finish the treatments. Dr. McSweeny performs all dental procedures himself, unlike many facilities that have a technician do them. So, if you’ve noticed a change in your dog or cat’s eating or chew-toy habits, gum swelling, tooth discoloration, or breath, please call us to schedule a dental checkup.